Earlier this evening, I was lucky enough to secure a fare to Heathrow Airport; a trip which always provides a welcome contribution towards the daily diesel fund. Conveying a passenger to Heathrow during the rush hour is always guaranteed to get the adrenalin going… a battle through the London traffic, ploughing through a sea of glowing red brake-lights as the passenger anxiously examines their watch, wondering if they will ever make it into the darkening, twilight sky. As you approach the western limits, the cabbie has to contend with the motorist’s arch-nemesis; the Hammersmith Flyover; a real head-ache maker which is currently reduced to one lane, swarming with traffic cones and gangs of workmen, all decked out in luminous orange. Once over that, it’s the M4 motorway all the way; a final last sprint towards the vast airport; clock ticking away, darting between lorries bound for Heathrow’s cargo terminal whilst, to your left, large aircraft from all over the globe lumber into London on their final approach- looking slow and cumbersome, but always managing to overtake you. Once at the airport, it’s just as hectic, with more swarms of traffic, clattering luggage, planes roaring overhead and, in the middle of all this chaos, Heathrow’s tall radar; spinning round-and-round-and-round-and-round at a giddying speed… does that thing ever stop rotating? Just looking at it is exhausting! Once your passenger is safely dropped off and pounding towards the check-in desk, it’s time to catch your breath and head back into central London. You could of course rank-up at Heathrow, but that’s a complex process which involves paying for tokens and queuing in a large parking-lot, gazing up at a big, digital board which, after what seems like an eternity, will finally display your badge number and designated terminal. It’s a bit like waiting for the cheap kettle you ordered in Argos– only less fun. Last time I tried to get a job from Heathrow, I had to hang around for almost four hours, so now I tend to head straight back into town and hope for the best. As you head back towards London, the M4 motorway becomes elevated, and you are whisked high over the rooftops for some two miles. This section of the motorway is characterized by the large offices and car show rooms which flank each side of the road’s bridge. 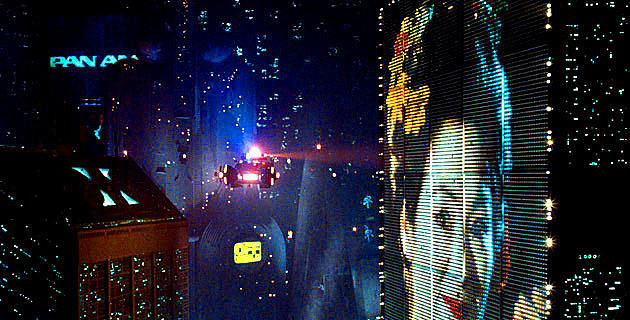 Many of these buildings have massive, illuminated billboards sprouting out of them and speeding past them at night often conjures up thoughts of the futuristic film, Blade Runner. Fastened to the side of a building on York Parade in Brentford, the Lucozade sign is an iconic image which was first unveiled in 1954; years before the M4 flyover was even built. 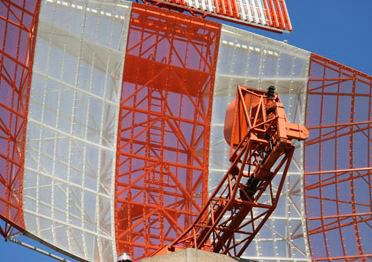 The sign was an early example of ‘kinetic sculpture’; a display which boasted movement. In this case, the kineticism came from the glittering bulbs, which emulated liquid being poured into a glass. The original sign (which even featured briefly in a 1975 episode of ‘The Sweeney‘) survived until 2004, when the building supporting it was demolished. Luckily, the 1950s display was carefully removed and is now housed in the nearby Gunnersbury Museum. 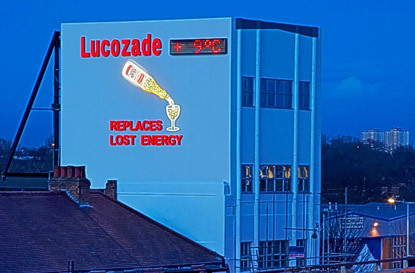 Following the building’s destruction, the famous sign which had welcomed weary motorists into London for so many years was sorely missed… so much so, that a campaign by local people was established; the aim being to get the retro Lucozade ad re-instated. Thanks to the hard-won copy, the iconic image can now continue to shine throughout the night; a beacon, pouring its never ending stream of glittering glucose into an equally bright glass, just like its predecessor did for fifty years. 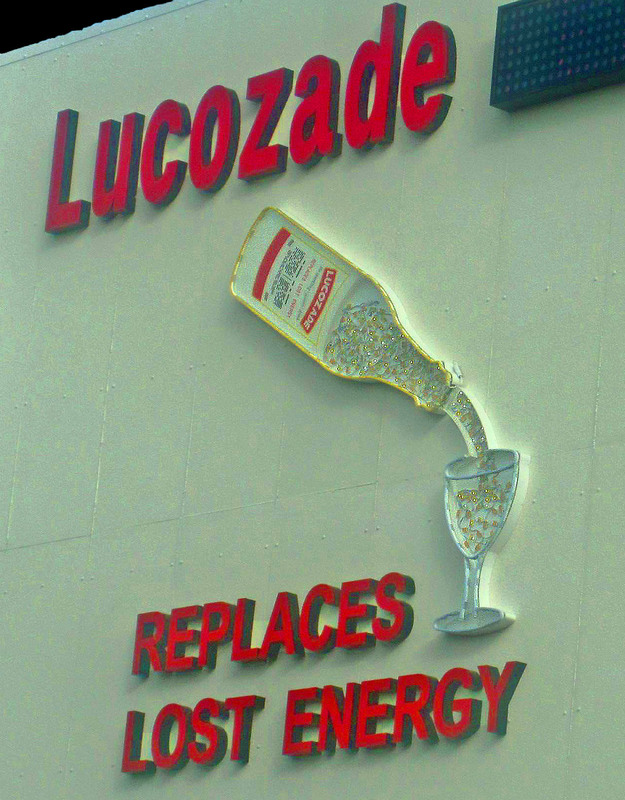 The sign’s original purpose- to advertise- must still be working too because, after my stressful trip to Heathrow, I really do feel the need to “replace lost energy” and stop off at the next available newsagent in order to purchase a bottle of good old Lucozade! Great post. I had no idea that there was a car park for cabbies at Heathrow and that you could be sent to any terminal. I do know that those based there are none too pleased if you hop in and ask to be taken to an airport hotel. Now I know why (although I think they can get a token to go ‘around again’?) ! You have to use a token every time you are sent to a terminal and you’re quite right; if it’s a local fare, you can rank up again without the wait… there is a time limit to get back though!